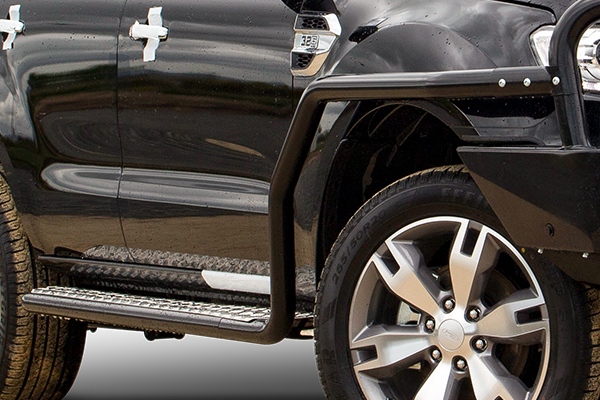 Surround your vehicle with solid, proven and most importantly safe protection. Offering excellent wheel arch, flare, sill and panel protection from rocks, road debris and the wandering Possum is just the first step. When fitting them to your steel bull bar they’ll increase the strength of the outer loops substantially. Featuring an all new side airbag compatible mounting system, designed and tested by TJM engineers, you can be assured that these side bars & steps deliver unsurpassed safety and strength for all environments. • Built from 50-63mm steel tubing. • Unrivalled wheel arch, flare, sill & panel protection. • Durable, lightweight checker plate steps. • Chassis mounted for extra strength.